I am well aware that September is not usually the time of year to be publishing an ice cream recipe. Until the beginning of this week, my mind had begun to turn to corn on the cob, squash and hearty bowls of soup. I was all set to add fish pie to next week's meal plan. Then here in London, summer decided it would have one last hurrah before ceding passage to the crisp, fresh days of autumn. As the table laden with gutsy, monochromatic bakes at Band of Bakers last night will testify, the regional bakes of our British Isles are not made for these Indian Summer days. A heavy and (dare I say it) rather stodgy collection of tarts, buns and cakes with more than their fair share of dried fruit, pastry and lard. Hailing from Derbyshire, I had my eye on a Buxton Pudding, a baked dessert made with egg yolks, sugar, flour, milk and lemon zest (which I've never eaten, let alone baked before) or some Ashbourne Gingerbread. Then on Sunday evening the ever-reliable Countryfile weather forecast painted a rather different picture of my week, with temperatures set to rocket back up in to 28C. I adore hot weather. Love it. But I'll be damned if I am going to entertain the thought of spending hours in a hot, sticky kitchen baking on a scorcher of a day. 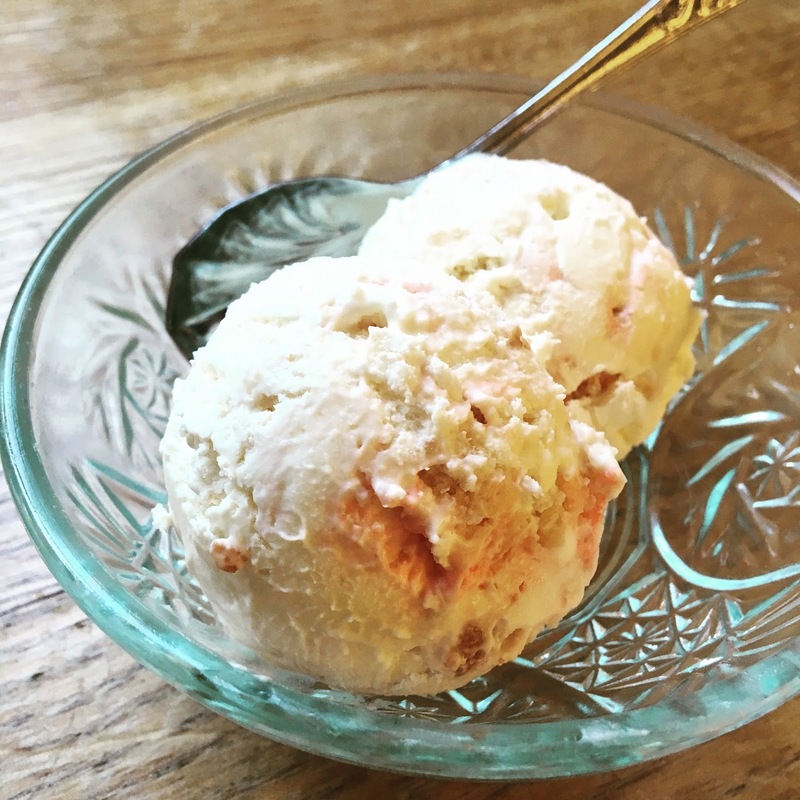 Everyone knows that ice cream is what we need on a hot day and this recipe is embarrassingly easy. Really. Damn it, you could even use shop bought madeira cake and a jar of good raspberry jam if you didn't have the time (or the heat tolerance) for baking and jamming. Just remember to take it out of the freezer 5 minutes before serving to come to (rather than taking it out 45 minutes before and then spending that time rushing to Band of Bakers with the ice cream in a cool bag, including a diversion due to jumping on the wrong bus, panicking that all the while your ice cream will turn up looking more like Bakewell Pudding Soup). 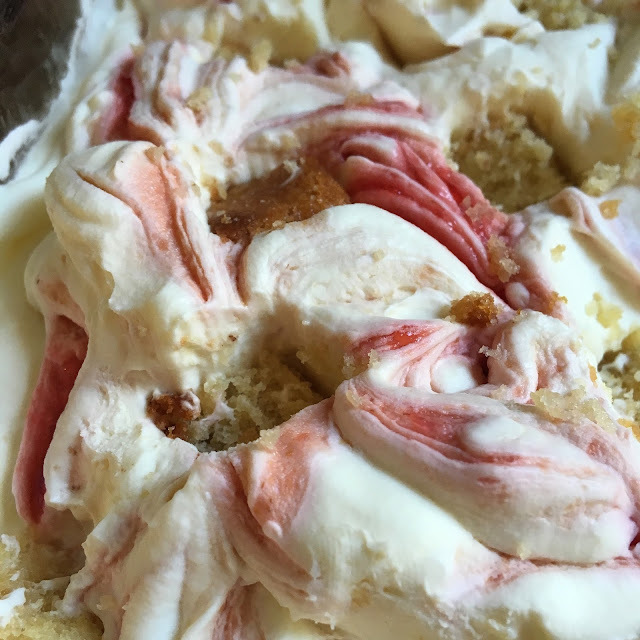 Begin the day before you want to eat the ice cream by making the frangipane and the raspberry jam (alternatively you can use a jar of good quality raspberry jam). Grease a small loose bottomed square or rectangular cake tin (a 15cm tin would work well here) with a little unsalted butter. Beat the eggs together with the lemon zest and amaretto, then add this to the butter and sugar mixture a little at a time and continue mixing until incorporated. Don't worry if the batter looks a little like it has curdled, it will come together when you add the flour. Bake for 18-22 minutes or until light brown on top and a skewer comes out with only a few moist crumbs. Leave to cool in the tin for 30 minutes and then remove from the tin and leave on a cooling rack until completely cool. Store in an airtight cake tin. Spread the sugar out on a large baking tray or roasting tin. Put the tray into the oven for 10 minutes to allow the sugar to heat up. In the meantime, put the raspberries into a jam pan or heavy based pan (I use an old Le Creuset casserole) over a low heat. Once the sugar is heated up (this helps it to dissolve quicker) add it to the raspberries along with the lemon juice and stir. Bring to the boil and boil rapidly for around 10 minutes. When the jam reaches about 106C remove from the heat and carefully pour through a metal sieve into a clean bowl, to remove the seeds. Set aside to cool. Put the cream into a large bowl. Whip the cream with electric beaters until it forms soft peaks. Add the almond extract and the condensed milk and continue to whip for about a minute until the mixture is quite stiff. Scrape the ice cream mixture into a large shallow pyrex dish or tin (I used two rectangular pyrex dishes which have plastic lids). Dot the cooled, sieved jam across the top of the ice cream and swirl gently using the end of a spoon or a knife. Slice the frangipane into small pieces (approximately 1cm cubes) and gently press them into the top of the ice cream mixture, taking care to space them evenly. You may not need all of the cake. Cover well and put into the freezer for at least 6 hours or, preferably, overnight. Remove from the freezer 5 minutes before serving.